Remnant tile bought online lends a subtle exoticism to the room. 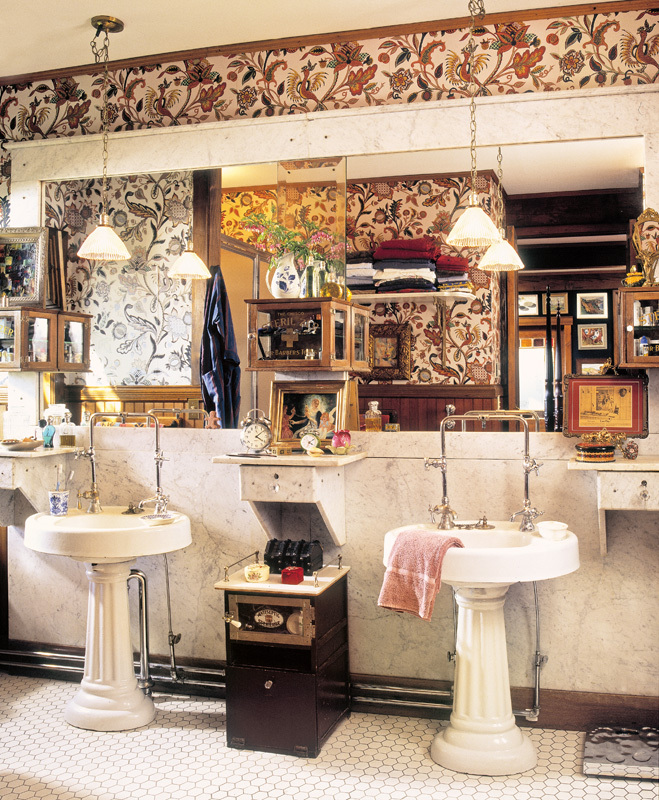 The concept of “salvage” has various meanings in this project, the budget-friendly makeover of a 1980s “Jack and Jill” bathroom in a Stowe, Vermont, townhouse. The cabinet is an example of salvage in situ: the existing one was kept and repainted. The wood countertop and sinks came from salvage dealers. 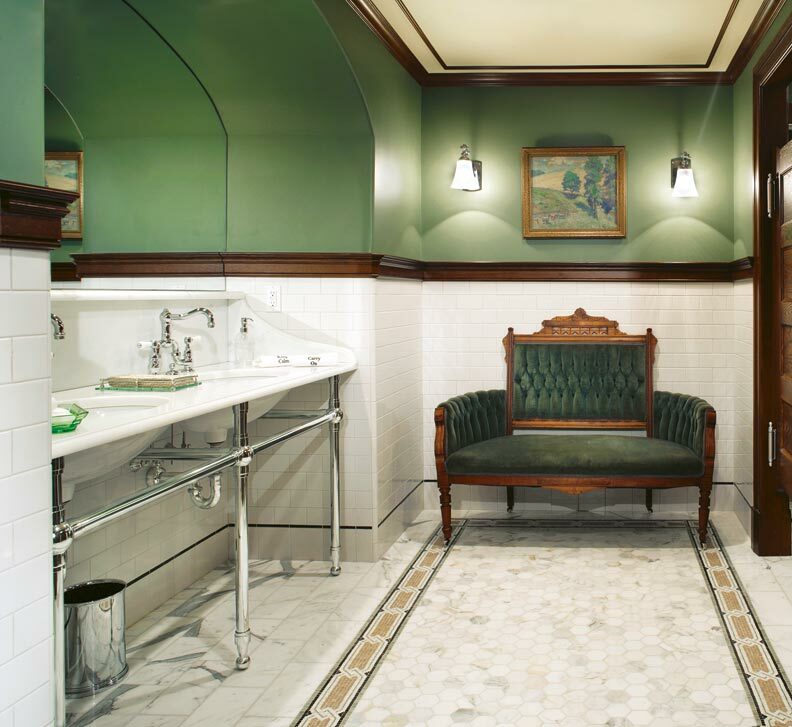 The tile that makes the room unique was purchased online—affordable leftovers from an unrelated project. The introduction of those of old sinks and vintage wood warmed the room considerably. 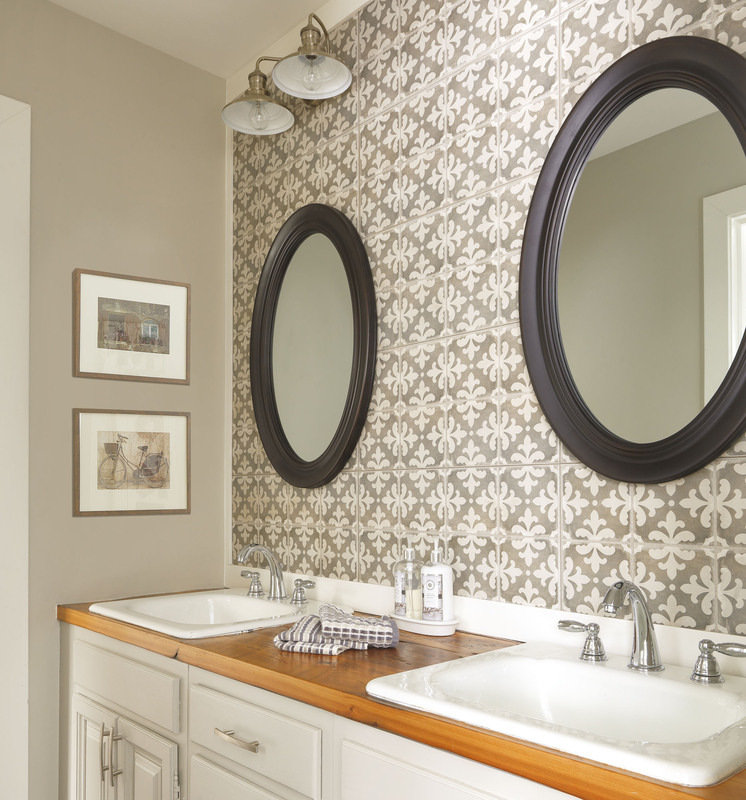 New textures and colors created a total bathroom makeover for under a grand! above Remnant tile bought online lends a subtle exoticism to the room. before With lacquered dark wood, laminate, and an ugly mirror, the room was stuck in 1980. With lacquered dark wood, laminate and an ugly mirror, the room was stuck in 1980. I saw no reason to discard the decent if generic vanity cabinet. Instead, I updated its looks with light-grey paint and new hardware. Good-enough cabinets can be sanded and stained or painted to give them an entirely new look. The old wood must be thoroughly clean and rid of soap scum, then lightly sanded and primed before painting. 2. SALVAGE ITEMSThe laminate countertop was replaced with a top made of reclaimed vintage wood. I found some pieces that were nice and thick—for both aesthetic and structural reasons, you don’t want a thin countertop. The boards were glued up, sanded and sealed, and then holes were cut for the sinks. It’s important to thoroughly seal wood used near water. The rimmed, drop-in, porcelain-on-cast-iron sinks came from the ReSource Building Material Store in Burlington, Vermont. In turn, everything we removed from the existing bathroom was donated to a local rebuild center—who sent someone to pick it all up. I found this fabulous, matte-finish, patterned cement tile online, left over from someone else’s project. There was just enough to entirely cover the feature wall behind the sinks vanity. The width of the grout line was chosen to ensure that full (uncut) tiles would be used at top and bottom of the wall installation. 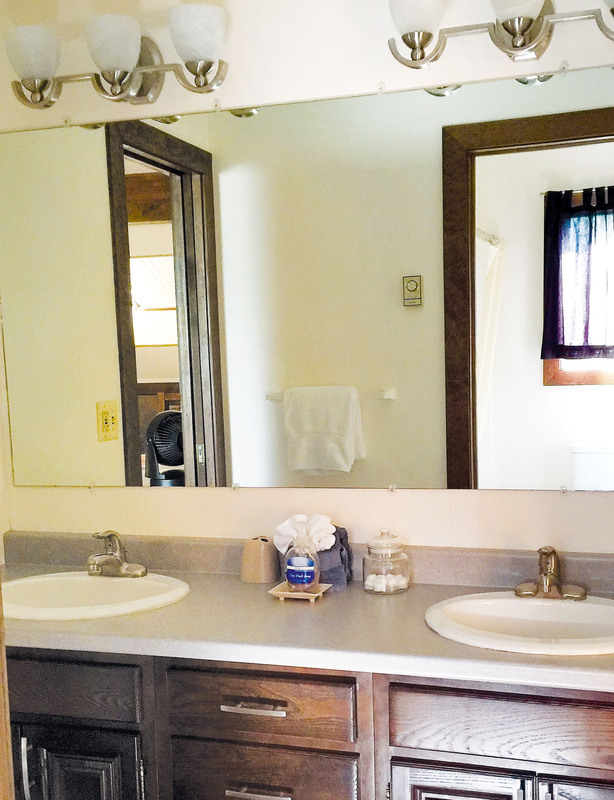 New, furniture-like mirrors and updated lighting finish the transformation. 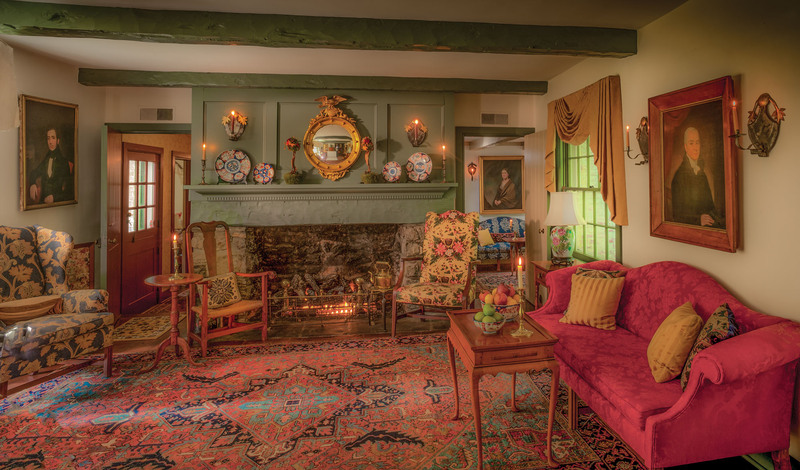 demand interior designer known for saving what can be saved and introducing vintage pieces. Her rooms are timeless and friendly—but there’s sophistication in her work. High-end clients include Vermont’s venerable Basin Harbor resort on Lake Champlain. “I have a problem,” Joanne says. 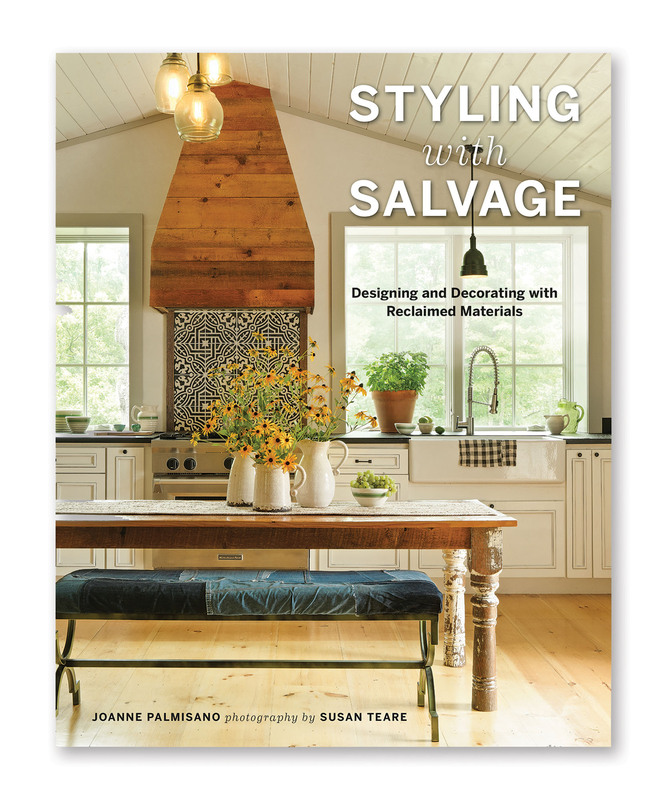 “I’m totally addicted to old stuff, vintage goods, salvaging, junk—whatever you call it; sometimes it’s the hunt, or the thrill of getting a good deal, but I’m always drawn by the stories behind the objects.” She reuses, she up-cycles, she mixes and matches, but always with the intention of keeping the patina … and keeping old things out of the landfill.